When the Arizona summer heat exceeds 110 degrees F and the landscape along the highway shows nothing but acres of spiny and unfriendly looking plants, one might declare cactus to be one of God's ugliest of creations. Yet, come back when the cactus flowers are in full bloom, and there will be a different verdict. All cacti produce flowers. The flowers might be bright yellow, red, orange or white. They bloom for just a few days and some only open at night. The cactus is a family of plants that are native to North and South America. There are about 2,000 species of cactus and most grow in hot, dry, desert regions. Some grow as tall trees, such as the saguaro, which is been referred to as the giant cactus. Other cactus, such as the prickly pear, tends to grow closer to the ground. The cactus is recognized for its prickly exterior. It is typically covered with clusters of sharp spines. The skin tends to be thick and fleshy which enables them to survive extreme hot weather and drought. Their stem holds water and the thick skin keeps it from evaporating. Some cacti will expand when taking in additional water, and then contract when there is water loss. The giant saguaro resembles a bare tree. It can grow to 60 feet in height. A barrel cactus can grow to about 10 feet in height. The jumping cholla can grow to about 5 feet in height. Their spines fall off so easily that they are called "jumping chollas" as the fine thorns seem to leap off when a person is standing close by. Cacti tends to grow very slowly, taking a year to grow just an inch in height. Cactus provides home and substance to native desert creatures. Small animals, birds and insects feed on the flowers of the cactus, while birds make their nests in the stems of cacti and woodpeckers live inside the larger plants. Some cactus is used as food, such as the prickly pear, whose stems can be fried and eaten (after all the spines have been removed). 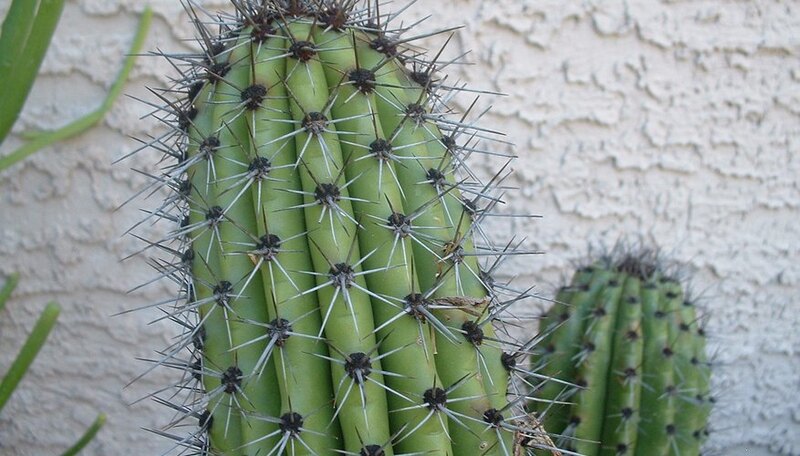 Some cactus is used as lumber and some for food dye. Scientists believe cactus has grown on the earth for millions of years. The first cactus resembled trees, with branches, woody stems and leaves. Primitive species of cactus still have these features. Over time leaves turned into spines and the branches became shorter, adapting to store water and survive in the hot desert region.